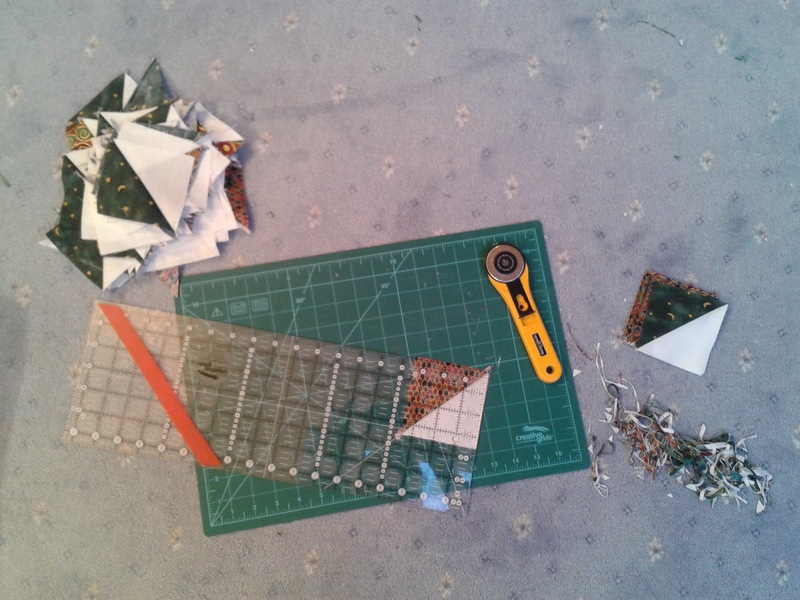 Well I am enjoying my own private Christmas Quiltalong extension sessions! I started to measure up my rectangles for trimming, but after finding the first half a dozen were the right size anyway, I stopped again. I'll have to do that job at some point, but I wanted to crack on with the exciting part of getting the next set of blocks underway. And now I am starting to trim the blocks to size. 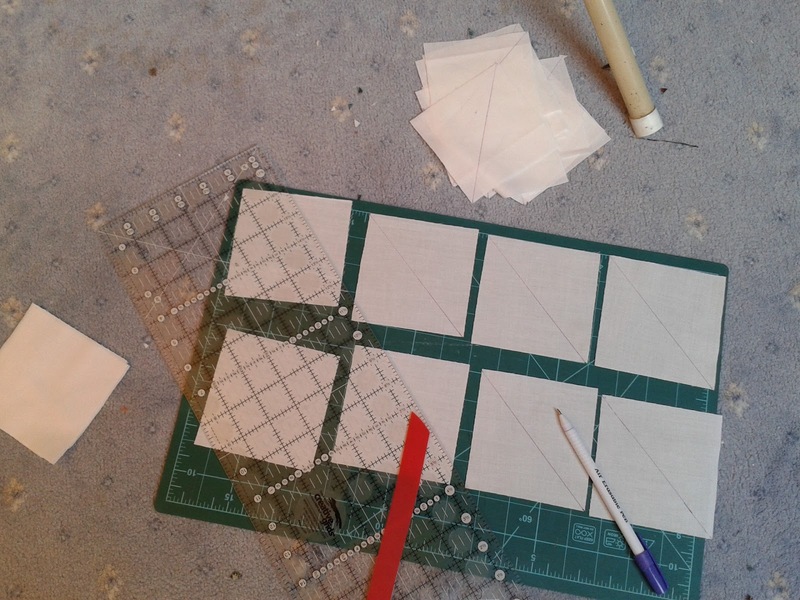 There is only one cloud on the horizon - you know that the very first instruction after cutting was 'Take the 3½” x 3½” background squares and put them in a bag labelled Unit A'? Well guess who can't find their bag labelled Unit A. I think it's in one of the fabric boxes, underneath a mountain of ironing, and the best way of finding it is to do the damn ironing. Boo! As you might imagine, Bilbo, the cats are not only silent on the matter, but assume an air of injured innocence if challenged. Ms Cha Cha finds the draped chain sewn block intriguing. Should your cats like company she would love to drop by and swing from the chains. Happy quilting. Oli in the pic is not so bothered with the bunting (at this point) and Dom asleep in the scraps crate stage right. 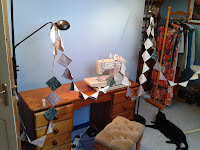 Although I would most certainly welcome Ms Cha Cha to join in with playing with the bunting, the boys would be aghast at a girl joining in, I suspect! Give her a stroke and nose-nudge from me! You're doing an awesome job of catching up! I'm sure you will find Unit A! Found it! Fund it! Ha! Looks like you are well busy anyhow, Mrs P! Would love to try your home made sausages - not something I'd think of trying here. Actually, I'm not sure why not, now I come to think of it. 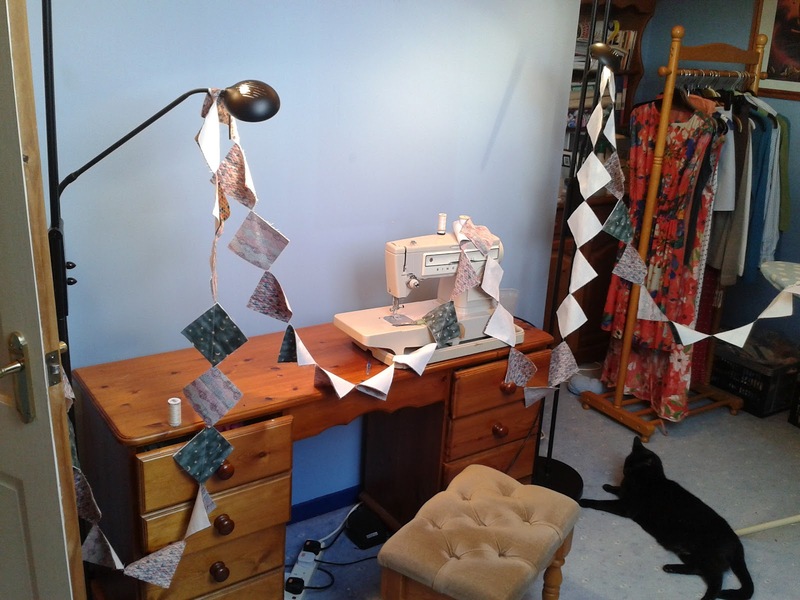 I think the bunting must be very tempting for naughty pussycats? Have you found your Unit A bag yet? You're going to need it soon. 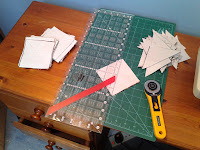 Having found 'Unit A' underneath shocking pile of ironing, Sue, I'm keen to play with a few layouts to try to second guess what you have in store for us! Oh no! 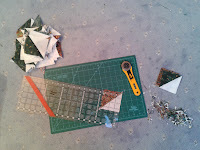 A missing bag of pieced quilt pieces. Oh dear. Hopefully that will turn up. Looks like you're going quite speedily though your HST's though. Happy sewing. All well now, thank you, S&S - I need to play with the blocks we have to try to work out the Mystery!